Adventure sports rider option for expats residing outside the United States is a great option to add to the GMMI and GMI international medical insurance. As an avid scuba diver, I always appreciate international medical insurance that covers or has the option to cover adventure sports. Let’s be clear here, just because adventure sports coverage option may be added (or already included) to an international medical insurance policy the applicant must do due diligence in verifying that their sport(s) is a covered benefit. If the applicant adds this adventure sports rider to their GMI or GMMI Gold Plus or Platinum option here is what is covered: Medical coverage to 25,000USD. The medical evacuation (medical transportation) benefit goes to the policy limit. Activities designated as “Adventure Sports” are limited to abseiling; BMX; bobsledding; bungee jumping; canyoning; cave tubing; caving; hang gliding; heli-skiing; high diving; hot air ballooning; inline skating; jet skiing; jungle zip lining; kayaking; mountaineering or rock climbing to elevation 4500 meters from ground level with proper ropes and guides; mountain biking; parachuting; paragliding; parascending; piloting a non-commercial aircraft; rappelling; scuba diving to a depth of no greater than 50 Meters; skydiving; snorkeling; snowboarding and snowmobiling; spelunking, surfing, trekking, whitewater rafting in water not exceeding Class V difficulty, wildlife safaris, windsurfing. Collision Sports: Sports involving great injury risk or where athletes purposely hit or collide with each other or inanimate objects, including the surface of the Earth, with great force (e.g. boxing, ice hockey, rugby, American football, lacrosse, rodeo, wrestling). Collision Sports do not include contact sports (e.g. basketball, soccer, baseball) where athletes routinely make contact with each other or inanimate objects, but usually with less force than in collision sports. Collision sports also do not include limited contact sports (e.g. softball, squash) where contact with other athletes or an inanimate object is infrequent or inadvertent. Professional Athletics: A sport activity, including practice, preparation, and actual sporting events, for any individual or organized team that is a member of a recognized professional sports organization, is directly supported or sponsored by a professional team or professional sports organization, is a member of a playing league that is directly supported or sponsored by a professional team or professional sports organization; or has any athlete receiving for his or her participation any kind of payment or compensation, directly or indirectly, from a professional team or professional sports organization. Sports Diving: Recreational underwater diving activities requiring the use of underwater or artificial breathing apparatus, and carried out in strict accordance with the guidelines, codes of good practice, and recommendations for safe diving practices as provided by an Authoritative Diving Body. 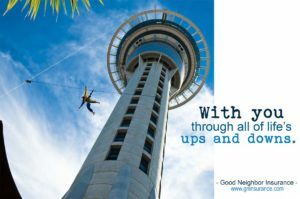 Good Neighbor Insurance is an international medical insurance brokerage firm serving those traveling and living overseas as well as short term medical insurance options in the U.S. to help those needing temporary health insurance cover. Our benefits also provide non-U.S. citizens with coverage options here in the U.S., including international students studying in the U.S., https://www.gninsurance.com/study-abroad-travel-insurance-students/. Our Good Neighbor Insurance licensed trained insurance team members are here to serve you, our guests! You may call us on our toll free number, 866-636-9100 or our Arizona phone numbers of 480-633-9500 or 480-813-9100. You may email us at info@gninsurance.com.